On the whole, teachers are divided on the question of whether today’s students are fundamentally different from previous generations. For instance, 47% of teachers surveyed agree with the statement that “today’s students are really no different than previous generations, they just have different tools through which to express themselves,” while 52% disagree with that statement. Surprisingly, teachers’ views of this statement are consistent across virtually all subgroups, including teacher age and experience, grade level taught, community type, student socioeconomic status, and subject taught. When asked in another item, however, whether they agree or disagree that “today’s students have fundamentally different cognitive skills because of the digital technologies they have grown up with” 88% of the teachers surveyed agree, including 40% who “strongly agree.” Teachers of the lowest income students are most likely to “strongly agree” with this statement (46%) but the difference across student socioeconomic status only ranges from 37% (mostly lower middle income) to 46%, and there are no other notable differences across subgroups of the sample. Focus group participants were likewise split on the question of how unique today’s students are. Some feel that growing up in the digital world has significantly impacted the way today’s students think and process information, yet an equal proportion of teachers expressed the opposing view, arguing that what they see in their students today is no different than what they have always encountered teaching young people. They suggest that while key habits and characteristics may take a different form, or be expressed differently, the underlying challenges they face teaching middle and high school students are the same today as they were prior to the digital explosion. Asked to evaluate this generation on more specific skills and characteristics, a vast majority of survey participants agree with the notion that “today’s students are more media savvy than previous generations” (86%). Yet, almost as many teachers disagree with the statement that “today’s students are more literate than previous generations” (80%). Older, more experienced teachers are slightly more likely than their younger counterparts to “strongly agree” with the idea that today’s students are more media savvy than prior generations. Among teachers ages 55 and older, 61% “strongly agree” with this idea, compared with 50% of younger teachers. Similarly, while 56% of those who have been teaching for 16 years or longer “strongly agree” that today’s students are more media savvy than prior generations, the same is true of 50% of those who have not been teaching as long. R: They [students] don’t read. There are readers and then there’s everybody else, and the readers are like few and far between. They don’t read even though we push them to read. R: The ability to focus on one task which is a lot of what we’re talking about here, to read a book from cover to cover and be able to do that and that alone is becoming enormously difficult. We’re reading Brave New World in our ELA class now for tenth grade ELA which is a staple book that every high school student has read for many, many years now. The book itself is about 170 or 175 pages. It’s not a long book. It’s certainly a book that’s rich in ideas and rich in language but it’s not a long book. I would say in terms of the section I teach, which is the [removed] section, I want to say of that 170 pages the average student has read between 40 and 45 so far and the book is supposed to have been completed last week. Now we read Romeo and Juliet before that. Again, the majority of the class did not complete reading the play…Now I certainly can’t speak for any other teacher here in terms of the percentage or the amount of text that they’re completing or not completing, but it does concern me. Again, I’m trying to find out why – why is this happening? And the answers I’m getting are pretty stock. I find that it’s boring, it’s not interesting. M: But do you think they’re not capable of doing it or do you think they don’t see value? R: No, no, I think the latter. I certainly think except for a very, very small percentage who might have more severe learning disabilities, a very, very small percentage, every student at this school is more than capable of reading. M: So it’s not that the technology actually is limiting their ability to read long texts deeply. It’s that it’s diminishing the value of doing it? R: I believe that is a component. I’d like to see more research done with that. I’d also like to see surveys conducted and get more quantitative data on that. R: I respectfully disagree…but I totally agree with [other teacher] that the internet has done a number and has weakened students’ ability to read for depth, to read for long periods of time and the idea of reading for enjoyment. I didn’t go to school that long ago but I remember that everybody liked to read something, whether it was Sports Illustrated or it was what you call it, science fiction stuff. Everybody liked to read something and we see a lot of students today who aren’t interested in reading anything, and I think that technology…that they become much more functional readers. It does connect to what [other teacher] was saying in that they’re reading stuff to get information and it goes to the speed piece, too. ‘I’m reading it to get the information to do what I need to do and that’s it.’ Why would I sit down and read a 180-page book? What am I going to get there? What’s in it for me? I’ve got to go. I’ve got things to do. R: I don’t think a lot of them are reading at all. I think that any kind of reading would be wonderful. Reading a comic book would be wonderful. Reading a graphic novel would be wonderful. Reading an online article would be wonderful. They’re not reading anything. They’re looking at pictures, they’re playing video games, and they’re on Facebook reading posts. I’m not talking about reading posts on Facebook. Reading something that takes some kind of stamina, it doesn’t matter even what the content is. R: I think many of the kids are reading but they are reading shorter things, one to four pages. Newspapers, I know a lot of our kids read newspapers which fits with [the focus of] the school. A lot of them read magazines. I’ve seen that some of the younger grades would get the scholastic magazines. They’ll read those but it’s always the same problem, you’re reading anywhere from one to six pages and they just – it’s a habit like anything else. You get into this mindset where you’ve got a short, maybe just one to six pages and pretty much done and I think they’ve got a great deal of difficulty segueing over to books which require more stamina and picking it and reading 10, 15, 20, 30, 40 pages, or even reading from beginning to end. The other thing that — I want to end on a positive note — is that we did read Of Mice and Men in the class and we did get I would say like 98% of the people were reading it, and it could be framed as boring but we didn’t. We framed it in an interesting way and they liked it. Some kids did download it on their phones and some kids did have Nooks and Kindles and they brought them in and that was their way of doing it and they found ways to highlight and everything, so that did help some of the kids who couldn’t get access to a printed copy. So I think that was a positive. R: But that said…the not reading book-length material goes back to [them being] used to short, not only well-edited, sometimes poorly written, but certainly short and not richly written material that they read on the internet. But that’s where their primary source of information now is either going to be internet, magazines or newspapers. They’re not doing books so I think one of the things I’d like to see in the schools is things like Nooks getting cheap enough [so] we can buy classrooms some Nooks or have enough that we can check them out or have a room where they can check out a Nook or read a book and have a place to read it. They might do that if the technology is there that makes the book accessible. They have a place where they cannot go to lunch where it’s crazy, [but] come up and have a quiet room. But that would require probably buying anywhere from 50 to 100 units. I mean it would be a great idea. The topic which generated perhaps the most intense discussion was that of “digital distractions” and their impact on today’s teens. Overwhelming majorities of survey participants agreed with the assertion that “today’s digital technologies are creating an easily distracted generation with short attention spans” (87%) and that “today’s students are too ‘plugged in’ and need more time away from their digital technologies” (86%). The former statement suggesting that digital technologies create an easily distracted generation elicited consistent responses across all subgroups of teachers, with no notable differences across teachers’ age, grade level taught, or years in the classroom. The latter statement suggesting students are “too plugged in” resonated slightly more with older teachers in the sample and among high school teachers. Among teachers ages 55 and older, 41% “strongly agree” with this statement, compared with 37% of teachers ages 35-54 and 32% of teachers ages 22-34. Interestingly, years teaching does not correlate with responses to this item. And while 32% of 6th-8th grade teachers “strongly agree” today’s students are “too plugged in,” the same is true of 39% of 9th-10th grade teachers and 37% of 11th-12th grade teachers. While these differences are notable, they are fairly small. 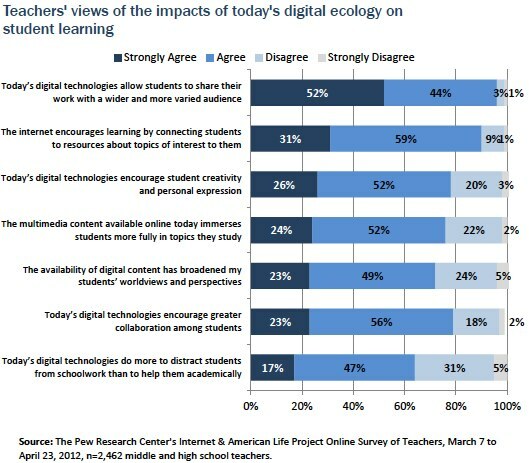 Moreover, in contrast to the many positive aspects of learning in a digital age teachers point to, nearly two-thirds of the AP and NWP teachers surveyed see digital technologies as “doing more to distract students than to help them academically.” Fully 64% of survey respondents agree to some extent with this notion, including 17% who “strongly agree,” indicating that while these teachers generally embrace the power of the internet and other digital tools to encourage and foster greater learning, many also worry that today’s digital environment results in more distracted students. High school teachers express more concern than middle school teachers when it comes to digital distractions. One in five 11th-12th grade teachers (19%) “strongly agree” that today’s digital tools do more to distract their students than to help them in the classroom, as do 17% of 9th-10th grade teachers. Among middle school teachers, 12% “strongly agree” this is the case. Asked about their students’ ability to multi-task in an age of constant information and distraction, teachers are more divided, with 46% agreeing that today’s students are “very skilled” in this area and 53% disagreeing. Surprisingly, teachers of middle school students are more likely to say this is true than are those teaching high school students. Among 6th-8th grade teachers, 54% agree to some degree with this statement, including 13% who “strongly agree.” Slightly fewer 11th-12th grade teachers (49%) agree at least somewhat that today’s students are “very skilled” multi-taskers. Even fewer 9th-10th grade teachers (45%) agree at least somewhat that today’s students are skilled multi-taskers. Teachers with more years in the classroom are actually more likely to agree with this statement than are those who have been in the classroom 15 years or fewer. Half of more experienced teachers (50%) agree at least somewhat that their students are skilled multi-taskers; that figure drops to 45% among newer teachers. This is a small difference, but may indicate that more experienced teachers see today’s generation comparing favorably to prior generations on this skill, particularly given the amount of information and constant communication today’s students are exposed to. In online focus groups with AP teachers, participants were specifically asked if they were “concerned that students are overexposed to technology.” Nearly all participants answered affirmatively that they see their students as “overexposed,” and expressed concern about the impact digital technologies might be having on their students both in terms of their performance in school as well as their wellbeing outside of school. Several participants worried that social media, cell phones, and other tech gadgets are being “abused” by students, and that students are “overstimulated” by doing too many things at once. Moreover, many teachers worry that these tools are adversely impacting students’ time management skills, fostering a (sometimes false) sense that all tasks can be completed quickly and at the last minute because so much information is so easily available. Several teachers suggested that it is critical for students to learn time management skills in their middle and high school years, or else it may harm their future success. They see time management skills as becoming increasingly important in a fast-paced digital world; at the same time, they see the skill potentially declining in their students. Yet, almost as many teachers argued that today’s students are not more easily distracted than prior generations, citing examples of students engaging with assignments over long periods of time. The difference, some teachers suggest, is that today’s students are easily bored by information that is presented in “traditional” ways and that teachers need to adjust their methods to engage students using the digital tools and formats that hold their attention. Some argue that today’s students are able to handle more information at one time because of the digital environment in which they have grown up, and that rather than being described as “easily distracted,” they should be viewed as being highly skilled at dividing their attention across several things at one time. Finally, some teachers in this study feel that the question of “digital distraction” may be a red herring, diverting attention away from other issues that need to be addressed in the classroom and society at large. Several suggest that the notion of student “distraction” should be reframed not as a problem with today’s students, but as a problem with teachers, parents, and the broader educational system. For these teachers, the “distracted” label is drawing attention away from a lack of technological skill or understanding among some parents, teachers, and administrators, which they see as the main issue to be addressed. Several labeled it an “excuse” adults use to avoid changing their own behavior and teaching methods. Others point out that the issue of “distraction,” valid or not, is a moot point; digital technologies will continue to emerge and shape the world in which teens and adults live, and educators must adapt to this environment.